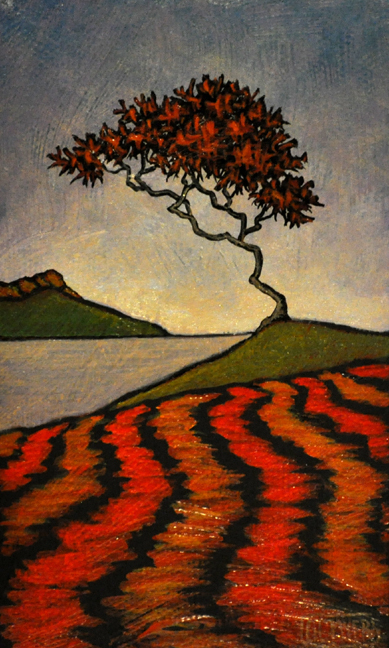 This is a very small painting, just a 3″ by 5″ canvas, that I call In the Blood. The title may in some way relate to the subject of yesterday’s post where I discussed why someone stays in their hometown even though its flaws and inadequacies become more and more evident, more glaring in the light of other seemingly better places. I wrote about having an attachment to this area through my family’s history, even though it is still relatively new to me. By that I mean that it was never a part of my early life, never really known in any detail by my father’s generation and was only uncovered through the access afforded by the availability of the many records and data online. There I discovered the history of my family here that had always eluded me and left me feeling as though I was unconnected to any place. I discovered relatives and names that were new to me, most interwoven with the history of this region of the country. This past week, I went to our local historical society, the Chemung Valley History Museum, looking for a piece of furniture that a friend of my sister had seen there , made around 1860 by a man with our family name. Our family is not one for artifacts handed down through generations. I envy people who can hold something tangible in their hands that was part of their ancestor’s lives, can literally feel that connection to their past. I can’t think of any such thing that exists in our family so the idea of an object made by an ancestor intrigued me. Going into the recent exhibit of items made in this county, the first piece that caught my eye was a chest of drawers with nice dimensions and a lovely reddish golden tone in its finish. I looked at the placard on it and sure enough, it was made by a man named George Myers. This was the connecting artifact I sought. He was my great- grand uncle a man who came with his brother ( my great-gr-grandfather) and his parents from Eastern Pennsylvania in the 1830’s and settled here. He was a furniture finisher who worked at a local furniture company, Hubbell’s, for nearly 50 years. His first son had fought in the Civil War, an event that was recalled in the 1940’s in an obituary of a younger son who told of remembering his older brother marching down Water Street in his Union Army uniform, heading out of town in a parade to the battles in the South. I was pleased to see this artifact, pleased to see it in a place where it would be cared for and kept. I was also pleased that it was a nice piece of work. It reminded me of the things I want in my own work. It was solid in construction, simple in design yet graceful. I sought out someone who might be able to tell me more and found the archivist, Rachel Dworkin. She didn’t have a lot of history on the chest but informed me that it was signed. She delicately took out the top drawer and on the back side there was a bold signature and date, 1861, in pencil, looking as fresh as though it had been written that very morning. But the thing that excited me was that after the signature he had drawn a face, a simple drawing of the side of what looked to be a young woman’s face. The lines, like the chest, were simple but confident and strong, drawn very much in the way I would draw a face, even now, and this thrilled me. I laughed out loud and tried to explain to Ms. Dworkin but I don’t think I could really fully explain what that little drawing meant to me, how it gave me a deeper connection to this place and person and made me feel as though he had that same need for expression that I feel. Maybe it was in the blood, after all. What a great post. The timing on the discovery of the drawing is incredible. Thank, Brian. I have to admit to being really excited when I read on the description of the chest that there was a drawing. Just that little thing made me feel as though I was seeing my world in much the same way that he was seeing his own. What a terrific story. I do think talents and leanings can be a “family matter”, even though, as often is noted, they can skip generations. When I read about the face, the word “talisman” came to mind. I’m not terribly superstitious, but I’m not above paying attention to messages from other times and places, either. My own precious object is a fife that belonged to my great-gr-grandfather. There’s no question it was his – whether he carried it in the Civil War I don’t know, but I like to think so. In any event, it’s one of those objects, like your chest, that links past and present. Your fife must be a very special thing to you. I would like to thinj that your ancestor and mine would be very happy, and perhaps a bit surprised, if they could somehow know that some small part of them has went forward and is still held precious.